When we arrive in June, spring has just begun. Leaves are just opening up on the willow shrubs (a favorite of moose.) miniature wildflowers bloom at your feet. We hike around and explore, finding antlers that moose and caribou have left behind. Aufeis, or overflow ice, lines the banks of the rivers and canyons. As the sunlight shines through the ice, oftentimes 5 or more feet thick, it glows blue, reminding us of the glaciers that once covered this area. 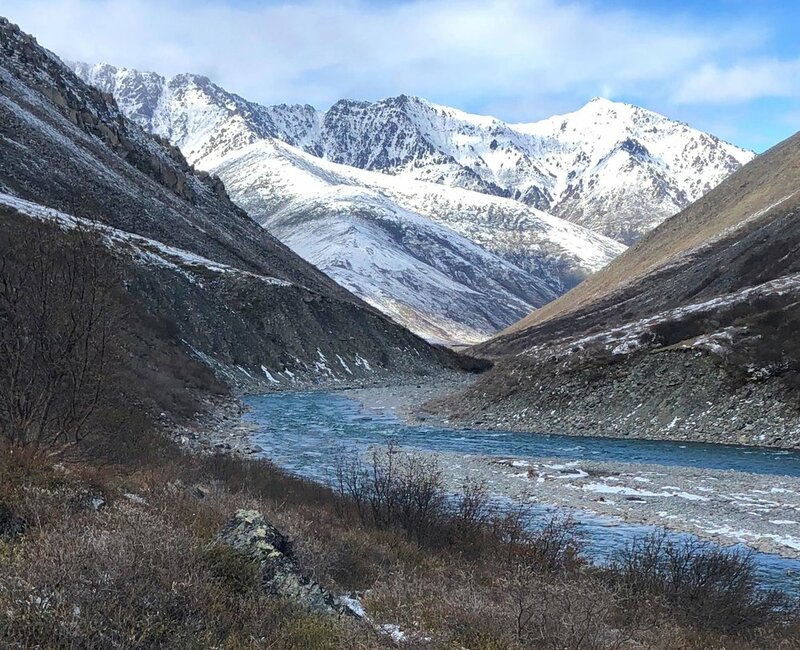 At first impression, the environment appears somewhat barren, but on closer discovery you quickly realize the biodiversity, with over 200 bird species being recorded and large herds of Caribou, Dall Sheep, Musk-Ox roaming the hillsides and tundra terrain. The Arctic National Wildlife Refuge is an important bird migration route, and serves as an intersection of 4 major flyways or routes that birds travel. There are over 45 different species of mammals in the region. Every year in the spring, the massive Porcupine Herd of Caribou numbering around 169,000, migrate hundreds of miles from their winter ranges in the Southern Brooks Range to the Arctic Coastal plain. Oftentimes we see smaller groups traveling in herds of 30-50. Occasionally, they come together en masse. As we float through the Davidson Mountains, the Kongakut river cuts through the cliff sides of the towering mountains above. The bedrock geology is diverse: plutonic, sedimentary, and meta-sedimentary rocks reveal Iron ore, quartz, serpentine, feldspar, and other minerals showing a kaleidoscope of folded rock formations. This is a true “arctic desert” where the rock towers that grace the tops of the mountain ridges are reminiscent of the American Southwest Desert. We stop for lunch and everyone drops a line in the water to fish, immediately we all have fish on. Schools of Arctic Char, Grayling, and Sheefish are everywhere. It’s non-stop until we jump back in the raft, and enjoy exciting small rapids for the rest of the afternoon. We have experienced all kinds of weather on these trips. Long sunny afternoons in tee-shirts on a sandy beach, waking up to snow, breezy days on the river. We are prepared for it all and it keeps us comfortable up there. We like to go in June because the the mosquitos and gnats are not out in force, and make it a lot more enjoyable! We woke up to snow, and then went for a day hike along the canyon to view the upcoming rapid section on the Kongakut River. We wake up to a couple of inches of snow one morning several days into the trip. Surprise!! We’re glad we always bring 4 season mountaineering tents on these trips. We didn’t even notice that it was snowing silently all night! We make our way to the cozy kitchen tent, start the 4 burner propane stove for coffee and tea. It’s plenty warm inside, and we quickly shed our clothing layers. By the time breakfast is finished the sun is out and the snow is quickly melting. It’s absolutely beautiful with everything sparkling in the fresh snow, the contrast of deep blue sky, songbirds and small mammals such as arctic hares and porcupines, adventuring around. We decide to spend another night here and go for a long afternoon hike along the canyon. We use the trails made from migrating caribou to lead the way. The next day we go through several miles of a whitewater canyon section. We’re about halfway down the river, and as we leave the canyon the terrain opens up out of the mountains. We are slightly disoriented, as we float out the mountains, the brisk arctic breeze reminds us were floating north. We are so used to coming out of the mountains and everything becomes warmer, not cooler. The river grows wider and runs faster now, and we are able to travel a lot of river miles. We make camp that night on a big gravel bar. Some of the group is fishing at a hole right in camp, some are gathering driftwood for a campfire for grilled steaks. On the other bank of the river we have a visitor! A 2 year old brown bear spots a couple fishing and takes interest. He stands up to look closely and starts to pace and tries to figure out how to get across the deep channel of fast moving water. A couple folks shout “bear!” and the fishermen stop fishing. One of the guides cooking comes out with some pans and bangs them together and he decides against coming across for a closer visit. We do see bears. These bears are truly wild and are not habituated to people. They do take interest in fish splashing the water, thats why we always stop fishing as soon as a bear takes notice. Almost always shouting “Hey bear, shoo! Go on!” or banging pans together keeps them from coming closer. We store all of our food in bear resistant locked metal boxes. We keep a clean camp. We want to keep the bears wild and everyone safe. The river continues to grow wider with more braids. Each year the channels change and move. Our campsites vary from year to year. We travel past cliffs that have Dall sheep perched on the tiniest ledges, carefully watching us as we float beneath them. Cliff swallows dive around, and peregrine falcons soar overhead. The sun is out and we float along for days, traveling 45 miles total in our 10 days. At the last mountain ridge before the river becomes extremely braided and shallow on the Arctic coastal plain, we find our take-out point. A rough gravel airstrip on a river bar. The fishing is amazing at this spot, and the fish are significantly larger. We enjoy our last day here, hiking along the tussocks, climbing up a hillside, and taking in everything. We’re so close to the Arctic coast, we wake up to a dense fog. The sun warms everything, and the fog lifts just in time as the bush planes come in to pick us up. We follow the river as we fly back to Arctic Village and then back to Fairbanks. We fly for hours. We point out where we camped, and see numerous herds of caribou. As we get closer to Arctic Village, We see the old overgrown corrals from generations ago, when the locals would herd the caribou into pens. The Gwich’in Nation call themselves the Caribou people and rely on these animals for their food, and hides. When we get back to Fairbanks, its 70 degrees. We all have are parkas, hats, and long underwear on. It’s solstice and 9 pm at night. The sun is shining bright out like its noon. We all revel how quickly we are in a modern city and how big Alaska really is. It’s been an amazing trip we will all remember the rest of our lives. Check out the Kongakut River page on our website for dates and information! To see more slideshows and videos of our adventures, Visit our new Youtube Channel.